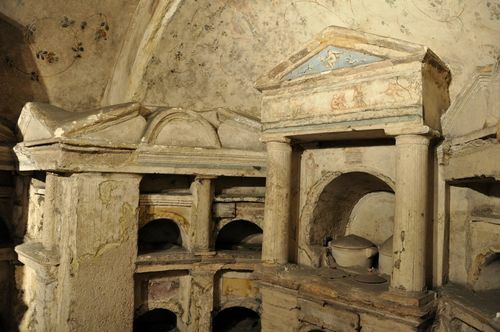 I’m constantly telling people to visit Naples, and I’ve finally written about one of my favorite reasons why: the catacombs of San Gaudioso. While Rome has no dearth of spine-tingling sites (hello, Capuchin crypt), these catacombs — which include a gallery in which desiccated heads were attached to the walls… and portraits of the dearly departed frescoed around them — are, hands-down, the creepiest place I’ve ever visited. The run-down: Like the spectacular catacombs of San Gennaro, the catacombs of San Gaudioso were first dug out in Greco-Roman times. They were used as an ancient necropolis and then — later — an early Christian cemetery. (If this sounds familiar, it’s because the catacombs in Rome have similar backstories, too). But after being inundated with the lave dei vergini (literally, the lava of the virgins; great name, right?) and abandoned in the 9th century, they were forgotten about. Until, that is, some enterprising Dominican friars decided to build a church here in the 17th century… and pay for it, at least in part, with their really gruesome fancy-schmancy burial practices. (So fancy, in fact, only nobles and high-level officials got the benefit of it. Really, who doesn’t want to be drained, beheaded and put on display for all eternity?!). Read more over in my story on the catacombs of San Gaudioso for BBC Culture, and remember: You have been warned. 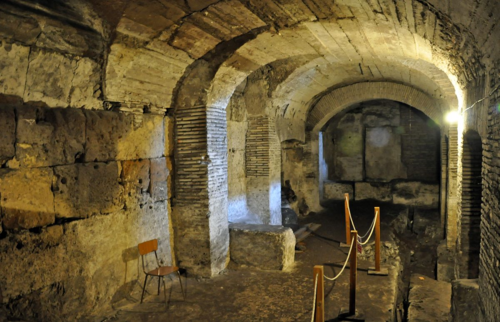 The catacombs of San Gaudioso are located in the Naples neighborhood of Rione Sanità. (If you go, don’t miss the equally creepy Cimitero delle Fontanelle). The entrance is at the Basilica Santa Maria della Sanità in Piazza Sanità. The catacombs are open from Monday to Sunday, 10am-1pm, but visitable only with a tour, which leaves every hour; the guides (who are super-enthusiastic and knowledgeable, by the way — not always the case in Italy!) speak English, so you can ask for an English-language tour. More info here. It costs €9 per adult, which also gets you entrance to the catacombs of San Gennaro (also a must-see). Also: two facts about ancient Rome you probably didn’t know, why you should visit Rome’s only pyramid and some other reasons to visit Naples. I’ve done a lot of cool things in Rome — but visiting the Columbarium of Pomponio Hylas is one of the coolest. And it’s one of Rome’s best-kept secrets. First off, let’s debunk the idea that Christians were the only ones who got neat underground burial chambers in Rome. In fact, the practice of interring the dead below ground went back to the pagan Romans. 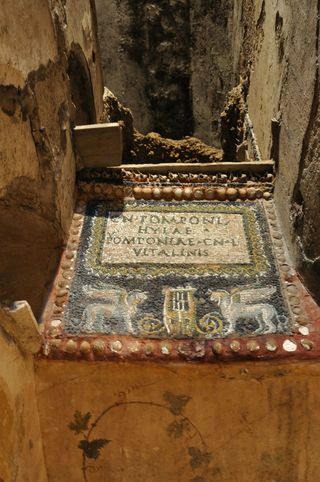 One popular way to do this was with a columbarium — an underground chamber built and decorated to hold the urns of Romans’ ashes, either for one family or many. (Later, around the time of Trajan in the 2nd century, pagans would stop incinerating their dead and start burying whole bodies in catacombs. The Christians took up the same idea and, along with continuing to bury their dead side-by-side with pagans in mixed catacombs, also started building catacombs just for Christians). 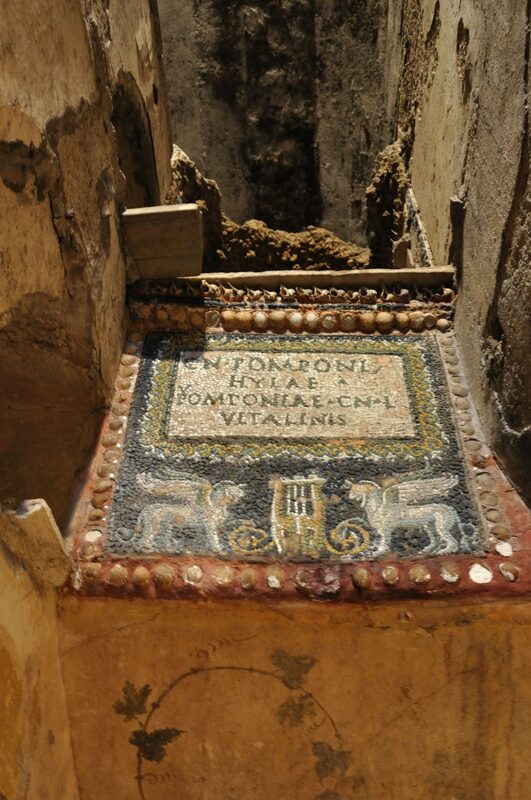 Needless to say, every once in a while, a new columbarium is discovered below Rome’s ground level. This one was found in 1831. And it dates way back — back earlier than the Christian catacombs — to between 14 and 54 A.D. The incredible thing? 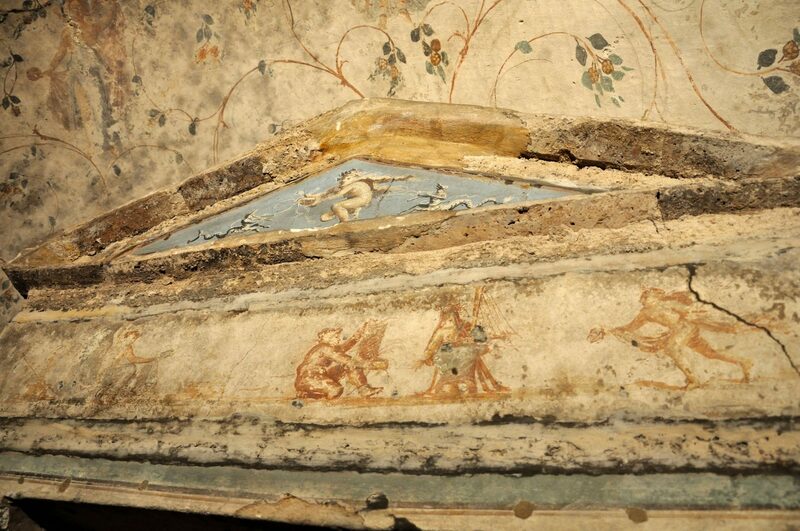 Many of the frescoes and decorations still look fresh. And lots of the burial urns are still there. The columbarium likely was founded by Pomponio Hylas for his family in the 1st century B.C. How do we know? The extraordinary mosaic that faces you as you descend down the stairs into the space. The chamber itself is small. But it’s filled with beautifully-detailed, and preserved, frescoes and decorations, from mythological scenes to delicate, winding vines. There’s nothing quite as extraordinary as standing in the small chamber designed, so intimately, by a family for its dead, seeing the frescoes that they hired artists to paint, viewing the inscriptions with their individual names — and the urns that once contained their ashes. If it weren’t so beautiful, it would give you the shivers. And you’d never guess any of this from the outside. To book, you’re supposed to have a group of at least 10 people. Book by calling 060608. It costs €3 per person. Just promise one thing: If you go, you will not touch the frescoes, or anything else in there. That’s what destroys the artwork. 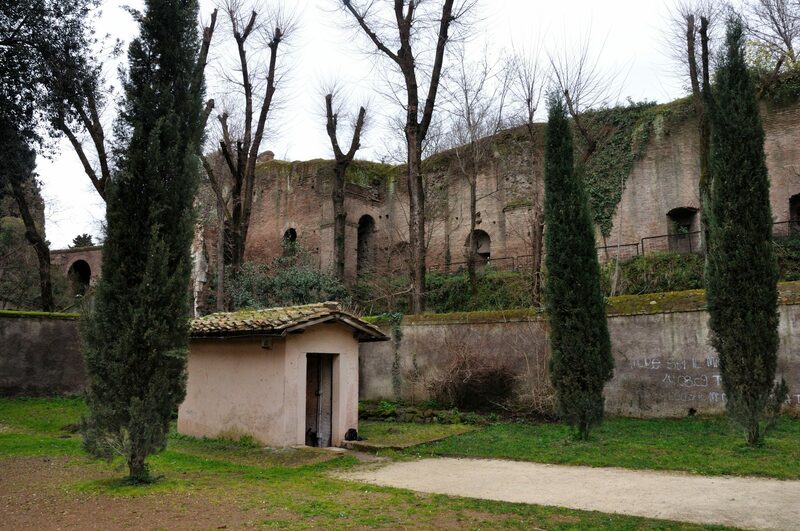 The columbarium is located in the Parco degli Scipioni, nearest to Via Latina 10. For a map, click here. 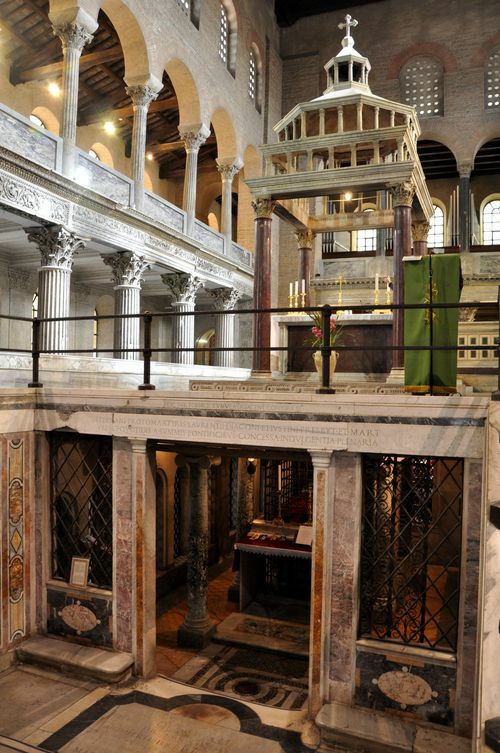 Want to find out about Rome’s other hidden gems? Check out The Revealed Rome Handbook: Tips and Tricks for Exploring the Eternal City, available for purchase on Amazon, below, or through my site here! Today, the neighborhood of San Lorenzo is known for its students, grungy atmosphere, graffiti… and as a place you might not exactly want to wander around alone late at night. But it should be known for something else, too: the magnificent church that gave the quarter its name. First off, San Lorenzo fuori le Mura (or "St. Lawrence outside the Walls," because it is — justbarely — outside the city center) is ancient. Literally. Better yet, more of the ancient design has survived here than in Rome's (admittedly many) other ancient churches. Emperor Constantine, the first Christian emperor of Rome, first built an oratory here in the 4th century; the church itself came in the 5th century and was reconstructed by the Byzantines in the 6th. And there are more than traces of the 5th- and 6th-century structures today. 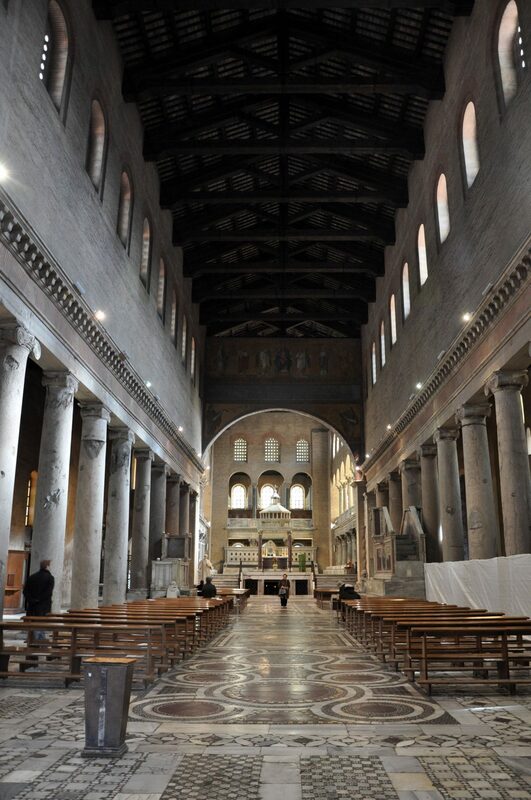 Walk up to the very front of the church and around the altar, and you're exploring the same aisles and chancel that the ancients built (below). Not only that, but the mosaic above you — restored in the Renaissance to the brilliant colors you see today — dates back to the Byzantines, too. Okay, so the church is ancient, and it's beautiful. Yeah, yeah. What else? Well, it's built on the spot where St. Lawrence himself is buried. One of Rome's most important saints, Lawrence met his fate during Valerian's persection of Christians in 258 A.D., and — the story has it — was grilled to death. (The Vatican has a sense of humor about the whole thing: Today, he's the patron saint of cooks and chefs). Lawrence was buried in Christian catacombs here, and when Constantine became emperor, he built a shrine and funerary hall at Lawrence's tomb. That's all directly under the church's altar today. And if you peek through one of the grates under the altar, and bring a flashlight (or a flash camera! 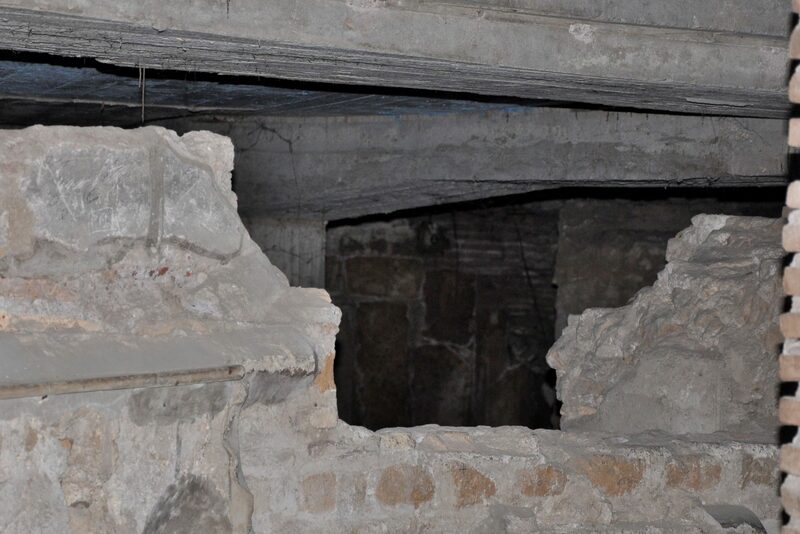 ), you can see some of the ancient tunnels that, presumably, lead down into those catacombs. If that doesn't do it for you, make sure you also check out the mysterious marble slab behind the altar: According to tradition, this is where Lawrence's body was laid after he was grilled… and it left a stain that would never go away. Not a big fan of St. Lawrence? Hey, it's okay. The church also has the remains of the martyrs St. Stephen and St. Justin, also beneath the altar. And if none of these ancient folks do it for you, then try the gloriously-decorated Chapel of Pope Pius IX, where the longest-reigning pope in history — as well as the pope who convened the First Vatican Council and decreed the dogma of the immaculate conception of Mary — is interred. The pope, who died in 1878, has been kept visible for the faithful today, with just a silver mask covering his face. All this, of course, is leaving lots of things out. Like the gorgeous 13th-century episcopal throne and marble screen, inlaid with precious porphyry and granite. Or the 13th-century frescoes, still in good condition, on the exterior of the church as you enter. Or the lovely 12th-century cloister, complete with fragments of ancient inscriptions and sarcophagi… and with the remnant of an all-too-modern bomb, courtesy of the Allies, that hit the cloister in World War II. I could go on. 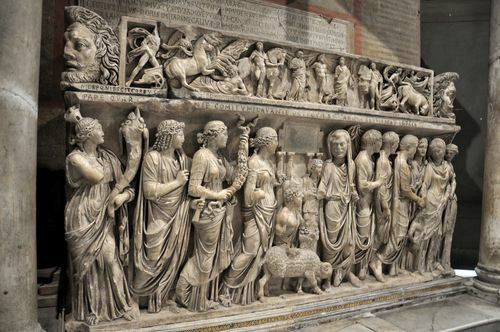 Instead, I'll just leave you with one last gem: a 2nd-century sarcophagus depicting a pagan marriage feast. (Today, incongruously, it holds the 13th-century remains of Cardinal Guglielmo Fieschi). The church is open daily from 7:30am-12:30pm, 3:30pm-7pm, and on Sundays from 7.30am-12.30pm and 4pm-8pm. It's located at Piazzale del Verano, 3, in the heart of San Lorenzo — a 20-minute walk from the Termini train station, or a 10-minute walk from the Policlinico metro stop on line B. Click here for a map. 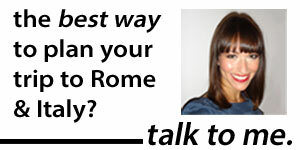 How Safe is Rome… Really? 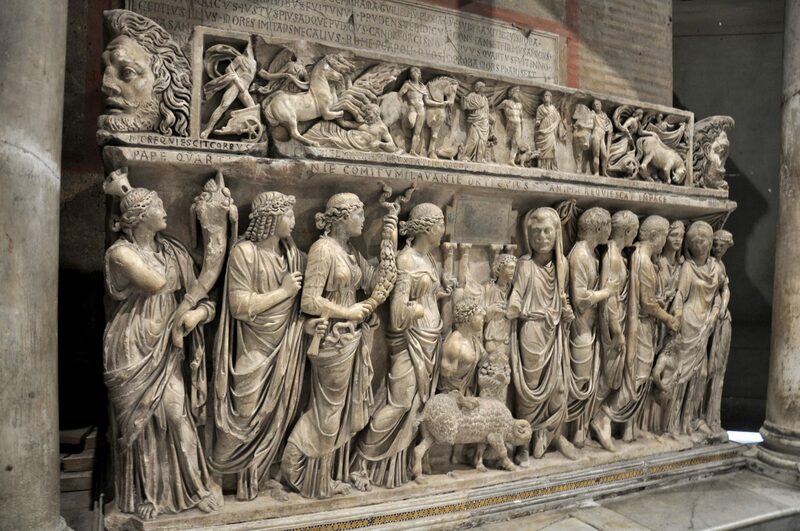 Rome's Best Archaeological Museum: Have You Been? You've probably heard of Rome's Christian catacombs, but many visitors to the eternal city haven't yet discovered their older counterparts: the Jewish catacombs of Villa Torlonia. That's partly because they're not open to the general public. That changes on September 5. Rome is opening the catacombs, which boast Jewish frescoes and tombs from the 2nd to 5th centuries AD, to visitors — for one day only. It's part of the city's participation in the annual European Day of Jewish Culture, celebrated by more than 25 countries. The free guided tours of the catacombs are available on the hour, all day. Interested? Book now. Even though the announcement appears to be so new that those working Rome's main telephone line for cultural events and reservations hadn't even heard of it yet, most of the tours have already been booked up — leaving only those at 1pm, 2pm and 3pm. Call +39 3407368280 to book. For more information about Villa Torlonia (in Italian), click here. For a map, click here. Hat tip: Katie Parla.